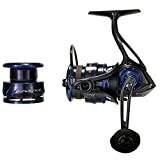 Compact & Strong made:These fishing reels finish with smooth action and sturdy craftsmanship. Saltwater standard quality material integrated:100% Stainless Steel, Strong Corrosion Resistance, Right/Left Exchangeable AL CNC Handle. 11 Ball Bearings and 1 Instant Anti-Reverse Roller Bearing,operate steadily even if your carbon fishing rod is under gravity.Transmission system gear is processed with high precision and passivated for corrosion resistance,sturdy and durable. 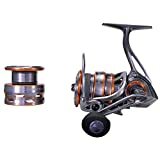 Adjustable line wheels and waterproof gasket, can be adjusted according to various conditions, more easily when fishing.Line wheels pads are made of Japan imported fiber,the brake force than ordinary braking force increased by 50%. It is a very versatile stainless steel sea fishing reels with Strong Anti-Corrosion. 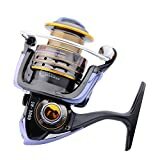 The spinning fishing reel can be used in river,lake, pond,pier,beach and shore etc.Wide range sizes make it target many species from freshwater to saltwater. 6.100% aluminum alloy rocker arm offers you enough power when fishing. 7.Corrosion Resistance up to 100% and Abrasion Resistance is relatively increased by 50%. 8.Bearings Anti-Rust Driver Gear,Oscillation Gear,Slide and so on.